Stripping back the layers to reveal actress Rebekah Sangeetha Dorai at her most vulnerable, while still showcasing all her talents. All her life, Rebekah Sangeetha Dorai has been playing roles. From spending long hours as a child parked in front of Channel News Asia emulating the broadcasters, to changing her accent to fit in, to her current career as an actress becoming a different character each time, Sangeetha has spent so much of her time in someone else’s shoes. Who then is the woman behind these roles, and can the real Sangeetha please stand up? That is an opportunity offered to Sangeetha in Building A Character, as she bares her very soul and declares all her innermost thoughts and feelings in this one-woman show. Directed by Teo Mei Ann and scripted by poet-playwright Ruth Tang, Building A Character is inspired by Konstantin Stanislavski’s handbook of the same name, and devised from the life and times of Sangeetha herself. Through the play, Sangeetha takes audiences on a journey into her past and analyses her present, charting the experiences and roles she’s played that’ve made her the person she is today. Any monodrama built around the real life of the actress playing it runs the risk of bordering on indulgent and self-serving, often leading to the question of ‘why should we care?’ But Sangeetha’s presence and performance alone is reason enough to make this show worth watching. Striding confidently out onstage, she opens with a little audience interaction and teasing, her winsome smile and natural ease onstage already make us want to know more about her, and Building A Character delivers completely on that promise. 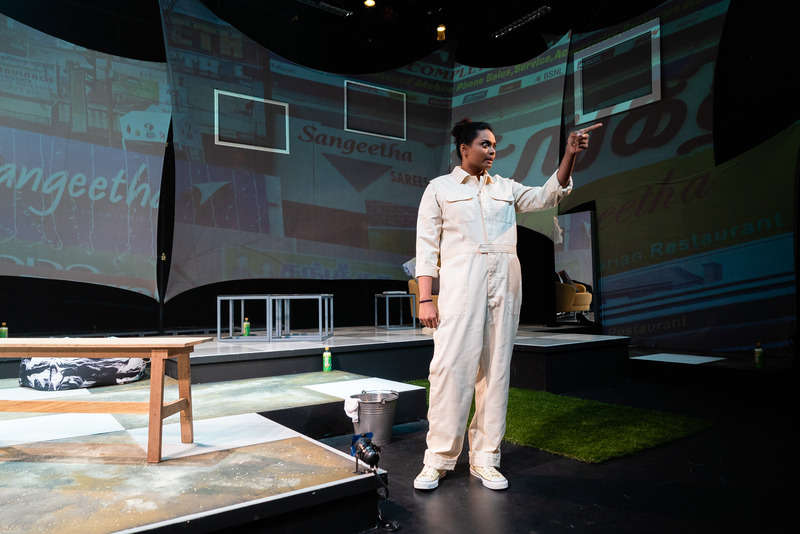 Sangeetha’s journey of selfhood begins at a bus-stop, as she opens with a self-directed question about her own beliefs and desires. 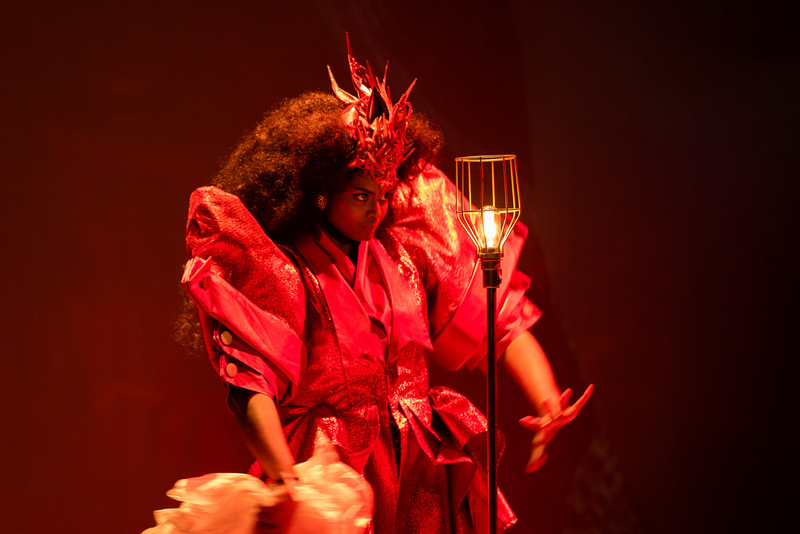 From here, we’re whisked off on a time-travelling journey as she recounts some of the most roles she’s played over the years, from a duck in Sarah Kane’s 4.48 Psychosis, to the fiery Jeyanthi in last year’s Boeing Boeing, to a Cantonese-speaking Lady Macbeth in a Chinese Opera-styled re-imagination of the Shakespeare tragedy. Each of these she plays well, showing us how effectively she metamorphoses into another character, performing as another person yet retaining a strong semblance of who she is and what she stands for, effectively done by weaving in a strong dose of humour on top of well-executed performances. There’s a fierce individuality to Sangeetha that is made startlingly obvious through Building A Character, in how she spends so much time committing herself to understanding each character and respecting both them and herself as she gets into each role, from refusing to swear in Caryl Churchill’s Top Girls, to finding a hidden desperation to Lady Macbeth’s famous ‘unsex me here’ monologue (not the Cantonese version). As entertaining as most of these initial performances and antics are (including hilariously, imagining herself starring in a stereotypical condominium ad), Building A Character is not merely a showcase of Sangeetha’s skills. Behind each of these performances, there is a discomfort that rests at the back of her mind, be it the resignation she has with the casting calls that call only for ‘Pan-asian/Chinese’, or the casual racism she receives when others comment ‘you’re funny…for an Indian’. And behind these doubts are some truly traumatic and heartrending incidents she’s gone through in life, from living on next to nothing to provide a meal for four people, to an estranged, abusive father she no longer recognizes on his deathbed years later, all of which have led to her literally ‘building a character’. To put her life onstage is bold enough, but to perform that trauma night after night and capturing that same, sincere show of emotion every time makes Sangeetha both incredibly brave and cements her position as one of the most talented young actresses in the scene today. Yoki Lai’s chessboard-like set helps reflect the parallels between Sangeetha’s life and it taking the form of a game, with countless battles and tribulations to be overcome as she advances and becomes stronger over time. It’s a set that is an extension of Sangeetha’s mindscape itself, with bottles of her favourite Pokka Green Tea bottles littered all over, and clearly sectioned areas where she associates with specific memories, traumatic or relaxing, with microphones hidden. Meanwhile Petrina Dawn Tan’s lighting is especially important in this production, particularly after Sangeetha discusses how stage lighting is always catered for Chinese people, and one then thinks about how perfectly illuminated she has been in each and every scene. One feels that Sangeetha’s performance, while strong, could have benefitted from a more cohesive script. 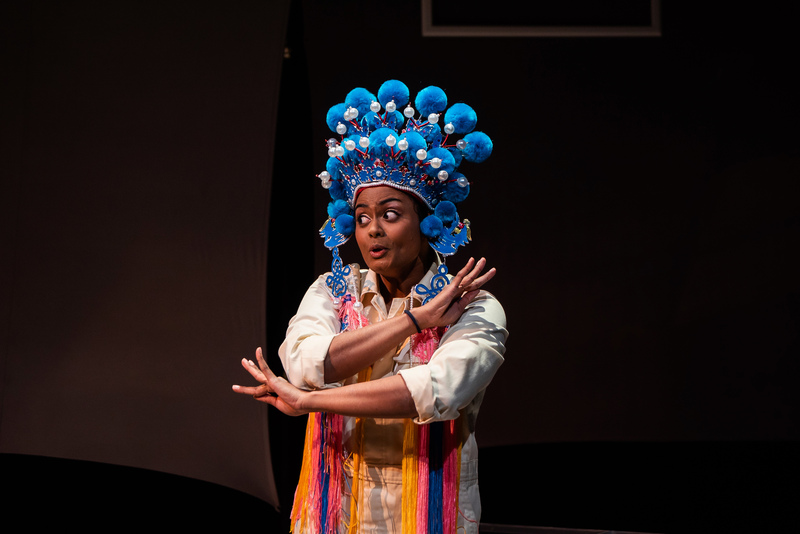 While Ruth Tang’s language reads like finely crafted poetry, there are multiple issues with how Sangeetha is made to double back again and again on issues previously raised, affecting the flow and pace of the entire play and taking away from the potential impact of some of her social commentary due to its repetition. Ultimately, Building A Character is a rare piece that allows an actress on the cusp of success to deliver what is probably the performance of a lifetime with the raw emotion she displays in playing herself. Playing to her talents from accents to impressions, singing to pure confessional drama, Building A Character is proof that the calluses Sangeetha’s developed over the years are the battle scars of a hardened warrior, building her into the actress and person we cannot help but fall in love with for her quiet strength, resilience over the years, and pure talent clear to see in this show.